This week is kicking our butts here at Tumbleweed Farm. The weeds are growing faster than the plants and we’re already losing daylight hours at (what feels like) a drastic pace. We’ve been slightly overwhelmed with the planting schedule that lies ahead while still trying to stay on top of basic things like irrigating, transplanting and weeding. We have a very large fall brassica planting that is going into the upper field next week so we’ve been busy prepping that area while still tilling sections of the lower fields in preparation for fall roots and greens. Our brains may be focused on autumn but the reality is that the summer crops are cranking and we need to relax a bit because many of our summer fruits and veggies are thriving and it’s easy to only focus on the stress of the future. Thankfully, through the stress and chaos of the days, we’re managing to eat like kings! No matter how stressed, overworked or broken down we may feel, I’ll be damned if we don’t sit down and clink glasses every evening and just “be”. This simple meal comes together in a flash and is especially tasty because we were gifted with some smoked salmon from our fisherman neighbor. The yogurt-dill sauce is delicious and versatile–I’m already planning on using it as a dip for zucchini fritters this weekend! I’m also using the leftover lentils for quick lunches this week–we’re going to toss the lentils with a little oil, herbs and fried eggs for some protein packed nourishment to keep us going! I hope wherever this post finds you that the summer bounty is abundant and you’re able to slow down in the evenings and enjoy a simple meal with someone you love. Combine the lentils and the vegetable broth in a saucepan and bring to a boil. Reduce heat and simmer, partially covering the pan, until the lentils are tender, about 30 minutes. Add more broth or water if need be to keep lentils covered. Check for doneness starting around 25 minutes. While the lentils cook prepare the yogurt sauce. Combine all the ingredients and whisk until smooth. Taste test and adjust flavors as needed. 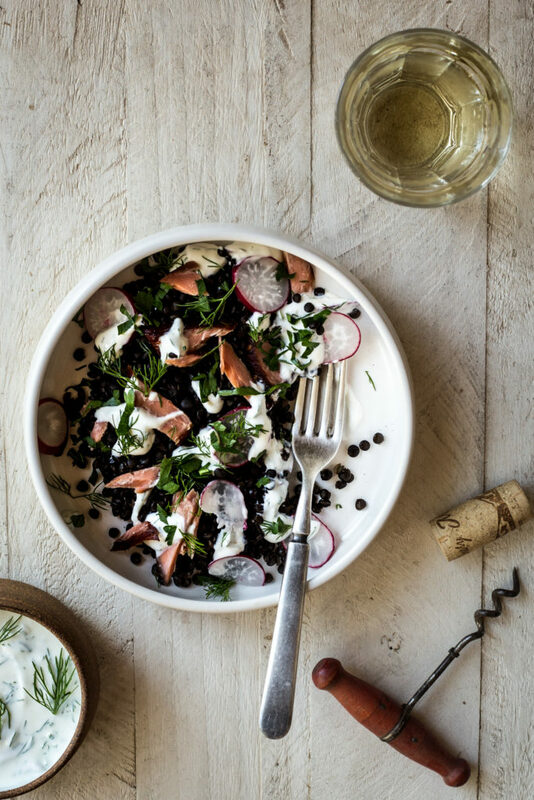 To serve, spoon a healthy portion of lentils between bowls and top with smoked salmon pieces, radishes, parsley, dill and a pinch of flakey sea salt. Drizzle in the yogurt sauce and enjoy.